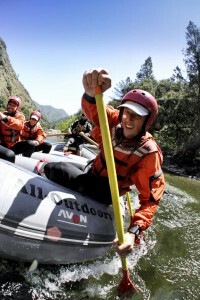 AO Blog > California Rivers: Flows, News, Events > When in Drought, There’s Still Water for Rafting! Droughts. They’re rough. They cause all sorts of troubles, but don’t jump to too many conclusions! Many people assume that droughts = no rafting, but that’s WRONG!!! Despite what you’d think, there’s still loads of incredible rafting options even when Mother Nature leaves us pretty high and dry. In normal snowpack years, AO offers a wider variety of rivers (ten throughout California! ), but even in drought, our rafting game is still strong. We still have trips available for all experience levels, from a family float to the most difficult commercially-run river in the United States, Express trip to 4-Day trips, car-access camping or wilderness camping, Class I to Class V…after 53 years on the rivers, our itinerary line-up is diverse. So, California, we’ve got you covered! There are over 800 rivers in California with over 1200 dams situated throughout. The reservoirs behind these dams come in all shapes and sizes and are positioned at all different elevations. In drought, the media spends a lot of time focusing on the large lower elevation reservoirs, such as Shasta, Oroville, Folsom, Don Pedro, etc. These reservoirs have huge water storage capacity and play a significant role in supplying California with agricultural and urban water needs. When their levels are low, California water supply is in trouble. These “mega reservoirs” require consistent normal to above-normal precipitation years to stay full. More importantly for rafting, it’s the little-seen and less-discussed HIGH ELEVATION water storage reservoirs that are the deciding factors of the well-being of our season. We raft the sections of rivers between the high-elevation reservoirs and the low-elevation mega reservoirs. And guess what? The higher elevation ones generally fare much better than the lower elevation reservoirs during years with low snow and rainfall. They’re much smaller and do not need as much precipitation to refill. Even if the snowpack isn’t packin’, all rainfall also plays a crucial role in the re-filling process..
Our four main reservoir-release rivers that we raft are conveniently between the fuller high-elevation reservoirs and the not-so-full low-elevation reservoirs. These rivers’ flows are reliable and predictable as they are determined by a set schedule of controlled releases from the upstream dams. Reservoir-release rivers will be flowing similar to most years, just without high water flows in the early months of the season that can occur after winters with above-normal snowfall. Also, the itineraries on these 4 rivers offer it all – from mild to wild! Tons of variety even during times of drought! – South Fork American River: fed by 7 high-elevation water storage reservoirs. A classic California river with itineraries enjoyed by guests age 5 to 85 (maybe even older!). Great for groups with mixed skill and experience levels. Not far from San Francisco or Lake Tahoe! – Middle Fork American River: fed by 2 high-elevation water storage reservoirs. A crystal-clear 16-mile stretch of river including the famous Tunnel Chute Rapid! This Class III-IV river is ideal for experienced rafters and adventurous beginners. Also not far from San Francisco or Lake Tahoe! 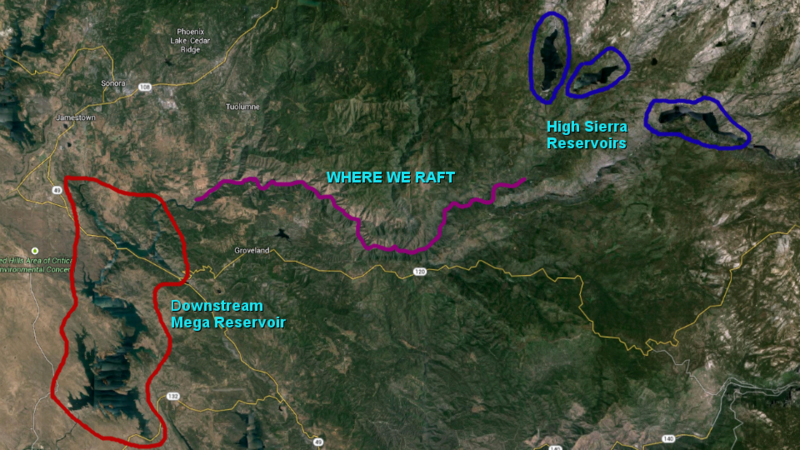 – Tuolumne River: fed by 3 high-elevation water storage reservoirs. A Wild & Scenic protected river that brings rafting enthusiasts from near and far to experience the quiet, beautiful canyon with Class IV-V rapids like the legendary Clavey Falls. Conveniently located about an hour from the western entrance to Yosemite National Park! – Cherry Creek: fed by 2 high-elevation water storage reservoirs. This is considered one of the most difficult commercial whitewater trips in the United States! Expect to be challenged and thrilled by this non-stop Class V river, especially during the Miracle Mile. This trip is a pinnacle for seasoned rafters as it is an experience of a lifetime! Also located about an hour from the western entrance to Yosemite National Park! Basically, there are many Government mandated licensing agreements that require the high-elevation reservoirs to release water to meet downstream obligations. Reliable rafting flows figure in to these licensing agreements when it comes to the timing and the amount of water released from the upstream reservoirs. After many years of working together with the organizations managing the reservoirs upstream of the sections we raft (For the American Rivers it is Sacramento Municipal Water Disctrict. 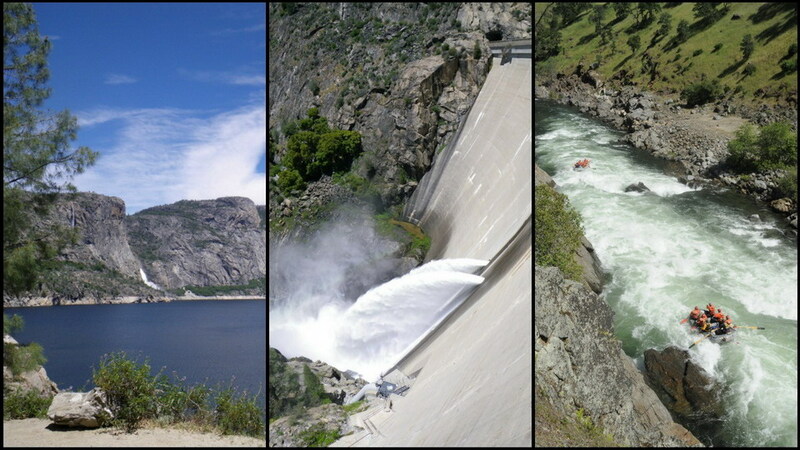 For the Tuolumne River it is San Francisco Water & Power. ), the rafting soft site community has established a symbiotic relationship making sure the release schedules work nicely for all parties involved. In conclusion, our diverse offerings of rivers and itineraries allow us to still provide the complete spectrum of options for a memorable rafting trip even during years of drought! For up-to-date water flow information and our rafting season length predictions for this year, go to our River Flows Page.